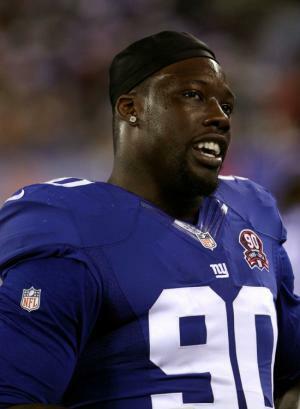 Jason Andrew Pierre-Paul, born on the 1st January, 1989, is an American Football player nicknamed JPP, best known as the defensive end player for the New York Giants. So how much is Paul’s net worth? As of early 2016, it is reported by authoritative sources to be $3 million, gained mostly from his contract with the New York Giants. Born in Deerfield Beach, Florida, Paul is the son of Jean and Marie who were originally from Haiti and immigrated into the United States in 1983. He attended his local high school Deerfield Beach High School, and there fell in love with basketball. Paul played the sport for four years until a leg injury prevented him from continuing the sport. After his days as a basketball player were over, Paul was undecided as to what to do next, until Coach Minnis, the coach of their football team saw him and saw his potential to play the sport. Not long after, Paul joined his American Football team and has excelled in the sport ever since. Because Paul’s academic records were not up to standard, he first enrolled at and played for the College of the Canyons in Santa Clarita, near Los Angeles. When Paul was not able to afford his education, later on he transferred to Fort Scott Community who offered him a scholarship. With his athletic performances, top colleges took notice until the University of South Florida in Tampa offered him a scholarship, effectively to play for their team. During Paul’s stay in USF, he made headlines for his incredible performances, and was even named by Pro Football Weekly as the First-team All-America and was recognized by the College Performance Awards as the Defensive Lineman Performer of the Week. Paul, who had now become known as the Haitian Sensation, decided to forego his senior year, and enter the National Football League(NFL) Draft for 2010. Paul became the 15th overall pick by the New York Giants, and officially on 31 July, 2010 he was offered a five-year contract of over $20 million with over $11 million guaranteed by the team, which obviously boosted his net worth enormously, and which now comprises his net worth. Soon, Paul became the secret weapon of the New York Giants; his speed, height and build made him the perfect defensive end in the team. In 2012, he helped his team win the coveted Super Bowl against the New England Patriots. Recently, Paul was caught in a fireworks accident during Independence Day celebrations, which eventually led to his right index finger being amputated. In 2016, he renewed his contract to continue playing for the Giants for a 1-year deal worth $10.5 million, turning down the offer from the Arizona Cardinals. In terms of his personal life, Jan Pierre Paul is with his girlfriend Farraw Germain who he met during his years in USF. The couple welcomed their son in February of 2015. 1 New York Giants defensive end.